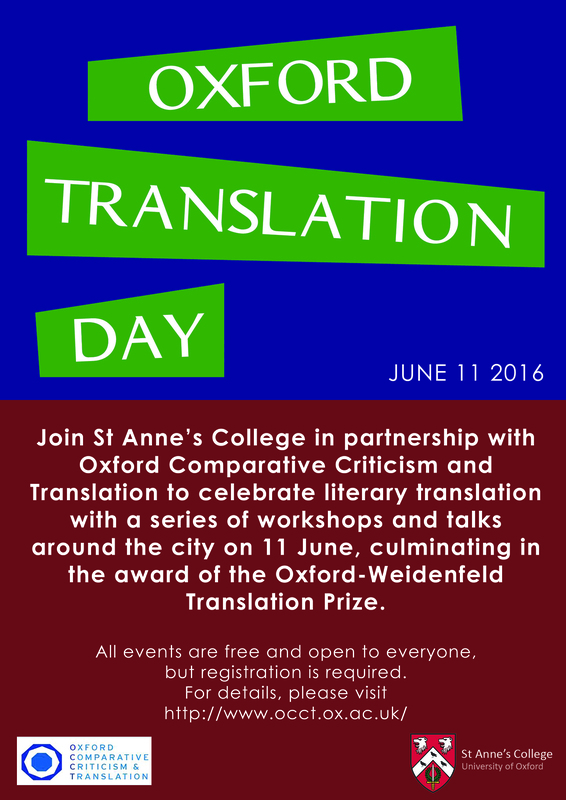 On June 11th, St Anne’s College ran the third Oxford Translation Day, a celebration of literary translation consisting of workshops and talks throughout the day at St Anne’s and around the city, culminating in the award of the Oxford-Weidenfeld Translation Prize. Oxford Translation Day is a joint venture of the Oxford-Weidenfeld Translation Prize and Oxford Comparative Criticism and Translation (the research programme housed in St Anne’s and the Oxford Research Centre for the Humanities), in partnership with the Oxford German Network and Modern Poetry in Translation. All events were free and open to anyone, but registration was required. This workshop focused on translating short stories from the French author Emmanuelle Pagano’s ground-breaking 2013 collection, Nouons-nous. Some of these ‘micro stories’ are just one sentence long, others longer, and the challenges of translating them bring out key questions in literary translation. Participants worked together to produce, compare and fine-tune translations of Pagano’s miniature stories, experimenting with different approaches to freedom and faithfulness. Run by Jenny Higgins, co-translator of Nouons-nous, this was a fun, challenging workshop designed to open up thinking about the creative possibilities of literary translation. Participants should have had at least AS-level French. In this creative, practical workshop, led by Rosalind Harvey (a translator of Hispanic fiction), participants had a chance to come up with their own translations of a short text using a range of media. A playful way to think about translation! No Spanish was required. Transgressions: A Discussion and Poetry Reading with Jamie McKendrick, Stephen Romer, and Karen Leeder. 'For translation to be an art, you have to make the uncomfortable but necessary transgressions an artist makes' (Idra Novey, Ways to Disappear, Little, Brown 2016). Three writers and translators discussed the difficult business of fetching over modern and contemporary voices, working with poets living and dead, and finding a voice for the very best in modern and contemporary European poetry in English. The English-speaking world likes to cling to English and American accounts of the events of 1936-39 and their aftermath but Spanish and Catalan writers Max Aub, Fernando Royuela, Mercè Rodoreda, Joan Sales, Emili Teixidor and others now in English translation challenge their often reductive, romanticised perspectives in fiction that is now recognised as among the best literary writing ever generated by the experience of war and its legacy. Will they ever make it to university reading lists hamstrung by nationalism and a resilient suspicion of translation? Can translators and publishers make a difference? These were the questions asked by the esteemed translator, Peter Bush. This fascinating paper coincided with the 80th anniversary of the start of the Spanish Civil War. This paper was chaired by Laura Lonsdale, Associate Professor of Modern Spanish Literature and the University of Oxford. In this talk, Professor Naomi Segal discussed her recently completed work of translating a psychoanalytic book from French into English –Didier Anzieu’s Le Moi-peau (1985, 1995): The Skin-ego (Karnac 2016). It explored in a series of ways the issues of translation in general and translating psychoanalysis in particular. Are all translators murderers, pests or parasites? Are they humble or the spokespersons of a community? Are they trustworthy or traitors, or even ‘faithful bigamists’? Might translation be a feminine/feminised activity because most translators are women, or because the target language has to be maternal, or because it embodies the paradox of the multi-skilled serving the mono-skilled? The second section looked at the translation of psychoanalysis, especially Strachey’s brilliant yet much-criticised translation of Freud. The paper ended with some personal observations arising from her work on Anzieu, and ending with the keyword that still, occasionally, keeps her awake at night. Professor John Fletcher of the University of Warwick chaired this event. Ulrike Draesner and Ewan Fernie came together to discuss what it means to translate Shakespeare in the year that we celebrate the 400th anniversary of his death. Starting from Draesner’s radical translation of 17 Shakespeare sonnets (which in turn inspired the translator Tom Cheesman to “English” her versions again) and Fernie’s Macbeth, Macbeth, a thrilling re-imagination of Shakespeare's darkest play, this event explored the multifarious meanings of text and subtext, the generation of new discourses, sounds, and forms, through the radical translation of the Bard. This event was chaired by Matthew Reynolds. Ulrike Draesner is a prize-winning writer of novels, short stories, critical essays and poetry. Prof Ewan Fernie is a critic and writer, and chair of Shakespeare Studies at the Shakespeare Institute, University of Birmingham. Prof Matthew Reynolds is a literary scholar and novelist, and chair of Oxford University's research programme in Comparative Criticism and Translation (OCCT). A conversation between Israeli poet Agi Mishol, her translator Joanna Chen and Prof. Adriana X Jacobs (Oriental Studies) on the recent publication of Less Like a Dove (Shearsman Books), a selection of Mishol's poetry that draws from several collections. This conversation addressed the translation process, as well as themes of translation that run through Mishol's work and this collection in particular. This event featured a bilingual reading of Mishol's poetry. Mishol is the author of more than 17 collections of poetry and has won numerous prizes both in Israel and abroad, including the 2014 Lerici Pea Prize. Chen's poetry, essays and literary translations have been published in Guernica, Poet Lore, Poetry International, Asymptote, and Newsweek. She has a column in The Los Angeles Review of Books. Jacobs is Associate Professor of Modern Hebrew Literature and Fellow of the Oxford Centre for Hebrew and Jewish Studies. The workshop examined the translation issues involved in the recent Channel 4 series Deutschland 83, which was broadcast with English subtitles. With the aid of clips from the series and quotations from UK press reviews, the workshop explored the linguistic and cultural issues that arise from the translation, to include the disparity between the original German opening credits and their UK version; the challenges of creating subtitles that reflect the subtleties of the German without being overly complex/verbose; cultural-transfer issues - translating 80s German culture for a 2016 UK audience; the use of English words, phrases and accents in the original German, and how this is negotiated in the subtitling, and issues relating to translation that have arisen in the programme's UK press reception. The workshop was highly interactive, structured through group discussion and included opportunities for participants to try their hand at translating for the screen. Some knowledge of German was required. Charlotte Ryland facilitated the workshop, with assistance from Oxford German Network 'student ambassadors. Sasha Dugdale, editor of Modern Poetry in Translation, and Charlie Louth, Fellow in German at the University of Oxford, were in conversation. The Oxford–Weidenfeld Prize is for book-length literary translations into English from any living European language. It aims to honour the craft of translation, and to recognise its cultural importance. The celebration featured readings from the work of the shortlisted translators, and the prize was presented.